Please join us Tuesday, February 9 from 5:00 PM-6:30 PM for a conversation with Michiyoshi Satō, a contemporary Tsugaru-jamisen performer. 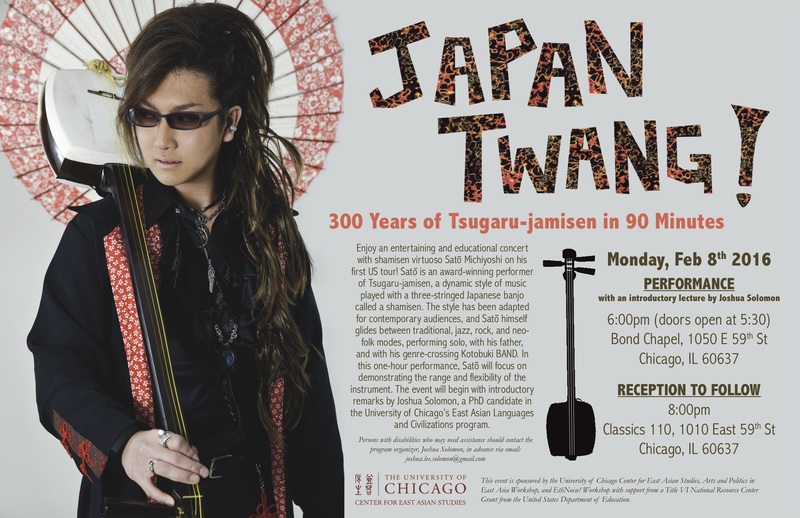 This event follows Satō’s performance on the previous day, which will be held at Bond Chapel at 6:00 p.m. Catering will be provided at the workshop. Annotated lyrics in Japanese and English are available via this link. Please do not circulate or cite the lyrics without the permission of Michiyoshi Sato and Joshua Soloman. If you have not received the password for the post, or if you have concerns about accessibility for this meeting, please do not hesitate to email David Krolikoski at davidkroli at uchicago.edu or Brian White at bmwhite at uchicago.edu.